When you go to an audition, knowing your lines and being in character are not the only things that you need to be prepared for. Knowing how to “slate” properly can be a deciding factor in whether or not you’re going to receive a call-back or book a job! A "slate" is essentially an introduction when you audition for a project. Typically, when you attend an audition--theatrical or commercial--you will be asked to slate your name for the camera before you go into the "scene" for which you have prepared. 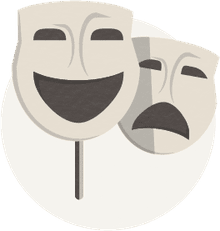 In theory, the actor slate should be very simple, however, your slate is the first (and sometimes only) impression that you give to a casting director (and anyone else in the audition room). Your slate is almost a mini-audition within itself and a bad slate often leads to a bad audition. If your slate isn't professional, conducted properly, or isn’t engaging, the casting director may choose to not even watch your actual audition. This is especially true in commercial castings when the process can move at lightning speed. Finding success as an actor is due in large part to being you and being natural. When you slate for the camera, think of it as though you are introducing yourself to a specific person. Get as specific as you can when finding a person to “introduce” yourself to. According to the LA acting coach, Carolyne Barry's program, "Carolyne Barry Creative," actors should slate as though they are introducing themselves to the president of the advertising agency. Creating a high-stakes scenario in your head takes the blandness out of simply saying your name to a camera and allows you to relax, as though you're speaking to an actual human. The slate process is slightly different for commercial and theatrical auditions. During commercial auditions, you will typically introduce yourself in the following manner (again, as though you’re introducing yourself to someone for the first time), "Hi, my name is _____." Then you will be asked to give your "profiles." When the session director asks to “see your profiles,” you turn to the right, then back towards the front, and then to the left, so that the camera can see your whole face. Rarely, if ever, should you turn your back to the camera unless you're asked to do so! It will look unprofessional. On certain occasions, you may be asked to show the front and back of your hands. Should this occasion arise, simply raise your hands up in front of your chest, as though you were about to give the camera a “double high-five,” for lack of a better description. Then, turn your hands around so that the camera can see the other sides of your hands. When learning how to properly slate (as well as learning how to audition well), finding a reputable on-camera class is critical. Two great classes to look into are Carolyne Barry Creative (mentioned above) and On Camera Classes with Christinna Chauncey.